So... I had some plain, mini, egg-shaped sugar cookies left over from Easter. What to do, what to do? A simple, little strawberry cookie would be perfect! Strawberries look like hearts to me, so I fashioned some imperfectly shaped hearts, freehand, onto the mini egg shapes with red royal icing. When I was done with all the outlining, I immediately began to fill in the strawberries with the red icing (working with a few at a time) then added little dots of thinner, white royal icing right away, while the red was still wet. Once that dried for about an hour, the green, leafy details were added, and then the small, red berries were left to dry overnight. No two are alike, just like the real deal. If you're not lucky enough to have strawberries year-round, just make some strawberry sugar cookies! I love strawberry cookies so much!!! Sue, you are so creative. Only you good make such cute strawberries out of eggs. I want to be you! Oh goodness! You "wow" me all the time. 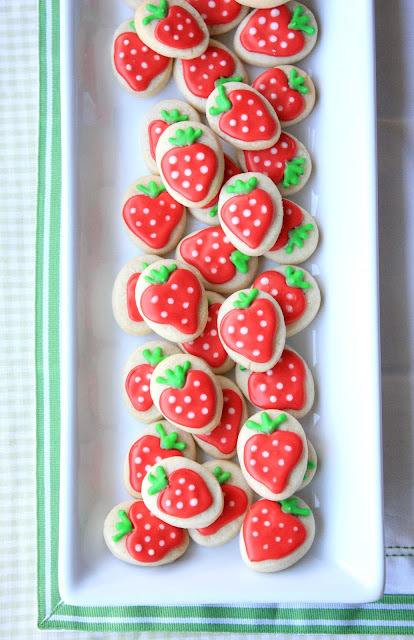 These strawberry sugar cookies are so adorable! So festive for spring! I can just make a batch of cookies dough just to make these as I didn't have any left over cookies. :) I love your creativity. Such a good way to utilize your egg cutter! It's perfect for strawberries. They are beautiful, Sue! These are so cute and I love that little basket! Awww these are so cute! I love strawberries, and these strawberry cookies are just adorable! Love it! These are so adorable. It's not quite strawberry season here in Michigan but these are making wish for summer. I knew I would find some cuteness over here! Love these sweet little cookies. Beautiful, cute mini cookies. Love the colours, and love strawberries. They're so pretty! They are very pretty little cookies. Good idea. These are absolutely stunning! And I love that each cookie is somewhat different from the next. I am completely in love with these! You are so amazing! Sue, these are absolutely beautiful! oh oh oh, what a delightful idea. It's adorable. You should do a basket full of berry cookies etc.. So adorable and sweet looking---great job! These cookies are adorable! I just found your site on Sweets for a Saturday-looks great! How lovely! You are a creative baker! These cookies are so darn cute, I really wish I have the skills and talent to make them. What a great idea for those leftover egg shaped cookies. These strawberries have so much personality. Love! Strawberries are my favorite, these look fantastic! well aren't these about the sweetest strawberries ever! I love them!! Pretty and tasty too! These are so cute. I'll be sharing them on Sunday on my "To Do List" post. Thanks for sharing! that's so cute! I would definitely want to do something like that! I want to make jars full of these and give them to my neighbors! Thanks for adding them to the link party! I just posted my own little strawberry cookies and then found yours! Great minds think alike ;) They're super cute and I love the idea to use a mini egg!